I don’t know about you, but I like my to savour my pints, consuming them from a clean pint glass, a nice branded beer bottle, or a schooner of some description in a sun-drenched pub garden – ideally a Spoons. Meet, Kevin Strahle, who deservedly garnered his nickname, The ‘LA Beast’, for food challenges that no human being should ever attempt, let alone successfully complete, film and upload to YouTube. The colourful character has chomped on a box of crayons, downed three bottles of Sriracha sauce, eaten 13 habanero peppers in 90 seconds and, in his brightest move to date, swallowed as many light bulbs as he can in 10 minutes. Now the human waste disposal unit embarks on a new challenge: to drink a six-pack of beer in 40 seconds or less. But it’s not just any beer. 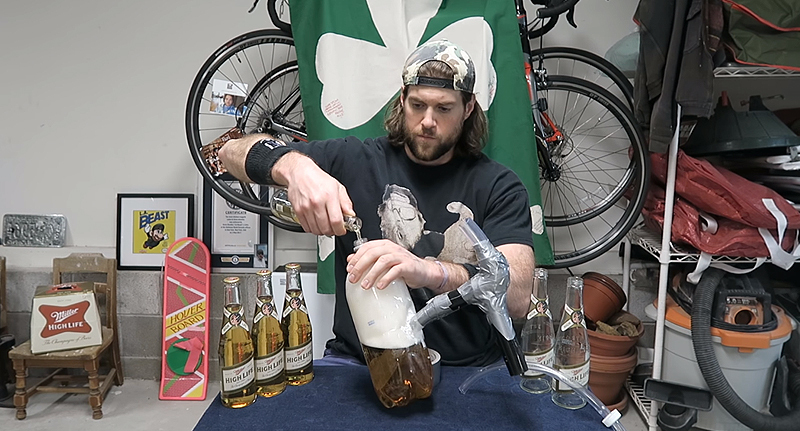 The unsponsored viral video sees Kevin neck six Miller High Lifes from his garage – the ‘Champagne of Beers’, apparently. Impossible, you say? Not for the Beast, clad in a black t-shirt emblazoned with his own face, whose stomach capacity is matched only by his resourcefulness and self-aggrandisation. 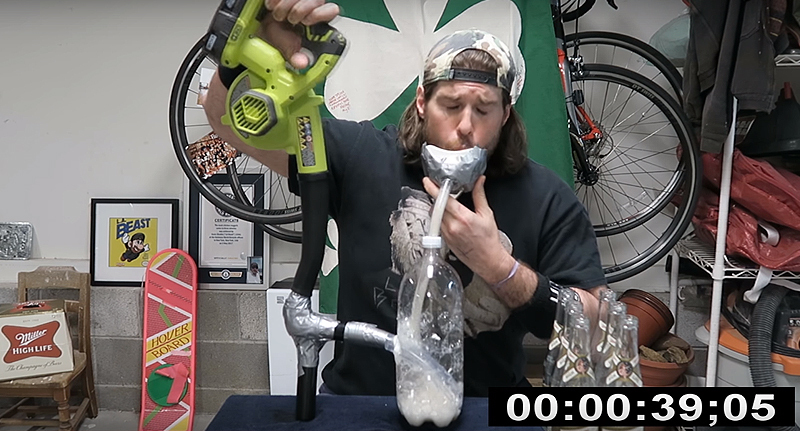 You’ve got to give it to him, Strahle is a man comfortable with his own digestive limits, and understanding this particular feat is pretty much the Mission Impossible of human consumption viral videos, he enlisted a little help from the crap he has in his garage. Namely, a leaf blower, which he fashions into a funnel and uses to pummel the beer down his gullet. He calls it his ‘High Powered Drinking Device’. 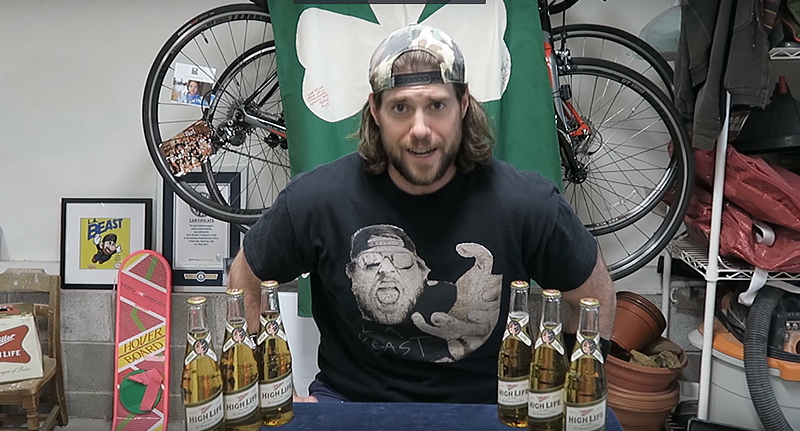 In 39.13 seconds, LA Beast consumed all six beers thanks to the brew being rocketed down his throat at full speed, and the curtain fall was celebrated with a patriotic trumpet tune, an alarmingly long burp and some hollering. I’m the L.A. Beast… And if anyone from NASA needs anymore scientists, don’t hesitate to give me a call. 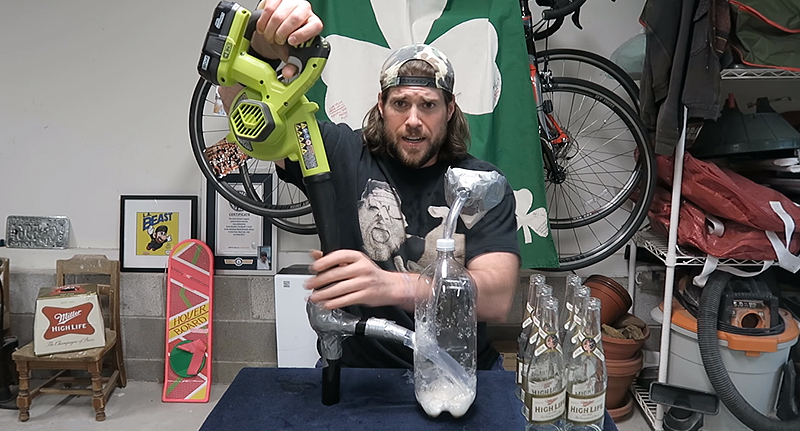 I’ll let everybody know when the leaf blower, the 72oz liquid annihilator, is available in my merch store. Have a good day. It’s not how I would personally choose to enjoy the golden nectar but I guess it gets that whole business of actually drinking and enjoying your alcoholic beverages out the way, and skips right to the getting drunk bit and burping obscenely… Because that seems like the healthy option, right? Forgive me for the following PSA, and for patronise all of you who prefer your beer in a pint glass, but I fear there are actually people in the world who would give this a go. Please, for the love of God, leaf *ahem* leave this to the so-called professionals. For independent alcohol advice, information and tools to help people make better choices about their drinking please visit Drinkaware.co.uk.